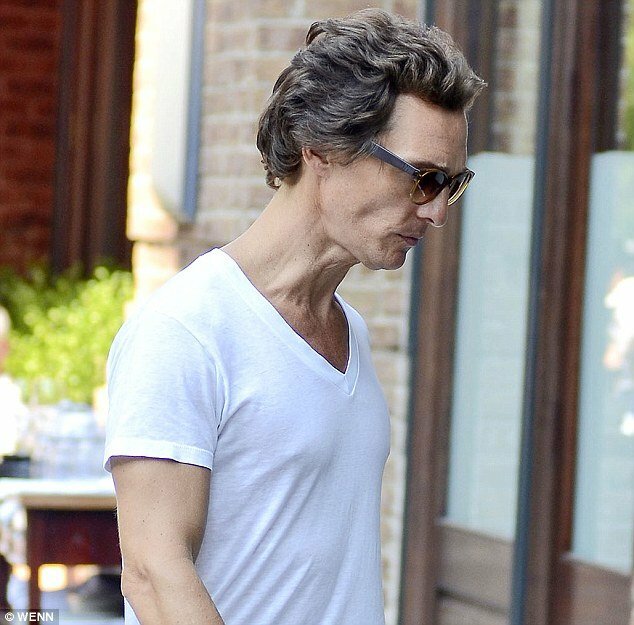 Matthew McConaughey was spotted a couple of days ago looking unrecognizable and showing off a gaunt frame on the set of his new movie. Matthew McConaughey, 42, appeared thinner than ever as he returned to his Manhattan hotel on Thursday. A white v-neck T-shirt, which would normally be fitted across his usual muscular torso, literally hung off the Hollywood hunk, while his blue jeans were even more baggier around his legs. His extreme weight loss – for a new role playing a HIV victim – has also caused him to look pale and gaunt, and much older than his 42 years. The actor is on a quest to lose a whopping 30 lbs for the new movie role and by the looks of it he is already there. Matthew McConaughey is currently in New York filming The Wolf of Wall Street, based on a memoir by Jordan Belfort who spent 22 months in jail for offenses related to stock market manipulation and running a boiler room. Work on the movie began in Manhattan earlier this month. The film, directed by Martin Scorsese, also features Leonardo DiCaprio, Jonah Hill, and French Academy Award winner Jean Dujardin and is set to open in theaters in 2013. But his weight loss is actually for his next role in The Dallas Buyer’s Club. Matthew McConaughey told Larry King in a recent interview: “I’m playing a guy who was sick and would have loved to have been healthier but wasn’t. The father-of-two, whose wife Camilla Alves is expecting their third child this fall, has been taking a philosophical approach to his punishing diet. “It’s a bit of a spiritual cleanse, mental cleanse,” he said. “It takes a while for your body to understand that it has to feed off of itself and that you’re not going to give it something else from the outside,” he adds. The gritty role is based on the real life story of a Dallas man named Ron Woodruff, who contracted HIV through drug use in the ‘80s.